Mormon Wookiee: #26: 2011 First Presidency Christmas Devotional. For me, nothing signals the start of the Christmas season quite like the annual First Presidency Christmas Devotional on the first Sunday of December (breaking out the 1978 Star Wars Holiday Special is a close second place). Each member of the First Presidency speaks, and music is performed by the Mormon Tabernacle Choir and Temple Square Orchestra. Both the music and the talks at the devotional are always fantastic. As a kid, I remember enjoying the talks given by President James E. Faust. He always had touching stories about his Christmases as a young boy. Tonight, President Dieter f. Uchtdorf, President Henry B. Eyring, and President Thomas S. Monson all spoke. 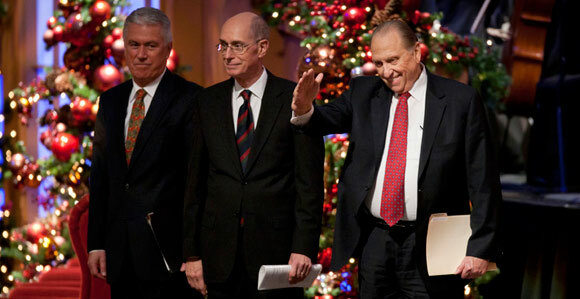 The full transcripts of their 2011 talks are not yet available (right now, the link shows the 2010 devotional talks), but when they are, you will be able to find them at http://lds.org/broadcasts/archive/christmas-devotional/2011/12?lang=eng. In the meantime, I would like to give a brief summary of their talks and my own impressions. President Uchtdorf, Eyring, and Monson (from left to right). With his typical wit, President Uchtdorf told the story of Christmas when he was a four-year-old boy in Czechoslovakia. One evening, he was in the room where his family kept their Christmas tree. The tree was decorated with ornaments, tinsel, and wax candles. President Uchtdorf took down and held one of the candles because he liked the way the light reflected in the window. He decided to stand next to the curtains in the window, and he soon learned two things: (1) the light looked beautiful behind the shadow of the curtains, and (2) the curtains were flammable. Fortunately, only the drapes were burned and no permanent damage occurred to the house. But as a small boy, he felt like he had ruined Christmas. His fear that he had ruined Christmas came from an understanding that, at that time, he didn't really know what the true meaning of Christmas was. He then acknowledged that in our day it is not only the children who do not always remember what the meaning of Christmas is, but adults as well. Today we become so focused on trying to make Christmas perfect, that the pressure becomes too much, and the perfect Christmas we have built up in our mind shatters around us whenever something goes wrong. As a result, the Christmas season becomes a time of stress and frustration instead of peace and joy. If we can learn to refocus on Christ, then Christmas will become much more meaningful to us. It does not require big changes in our lives--if we read a scripture or look for ways to serve, we will be able to keep the spirit of Christmas in our lives. We cannot give Christ the gift of perfection right now. But He does require that we give our best efforts to walk in the ways he has prepared and taught. On the other hand, the Savior's gifts to us are perfect, immeasurable, and incomparable. He has given us the gift of immortality and the possibility of eternal life with Him again, if we obey his commandments. He promises to be with us, to carry us when we stumble, to mourn and rejoice with us. Every day he offers to lead us by the hand. Because of Him, we can keep the spirit of Christmas with us always in our hearts. President Eyring spoke about the signs of Christ's birth as foretold by Samuel the Lamanite in the Book of Mormon. He also spoke about the Savior's birth (and the birth of his cousin John the Baptist) as found in the Book of Luke. For me, the highlight of President Eyring's talk was his overview of the Church's AWESOME new bible videos website. The videos were filmed on the Church's new film set in Goshen, Utah, which is a massive replica of areas of ancient Jerusalem and Bethlehem. President Eyring stopped in the middle of his talk to show a few short clips from these videos, focusing on Mary and the birth of Christ. There are still many of the videos in the editing stages, but you can see the available videos at http://lds.org/bible-videos?lang=eng. You need to check these out (like right now, people)!!! 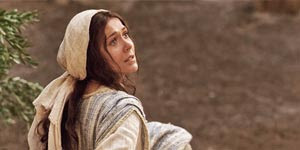 Mary is visited by the angel Gabriel, foretelling her role as the mother of the Son of God. Mary greets the shepherds at the birth of Christ. I was extremely touched by the videos shown by President Eyring. I can't wait to see more of them as they come out. I am so grateful for President Monson! The Spirit of the Lord radiates as he speaks. You can tell of the love that he has for not just members of the Church, but for all of humankind. He started his talk by saying "Thank you". He thanked those who came to the Conference Center, he thanked those who was watching at home, he thanked the employees of the church who work so hard to keep the operations of the Church running, and he thanked his two counselors, President Eyring and President Uchtdorf for their faithful service and friendship. 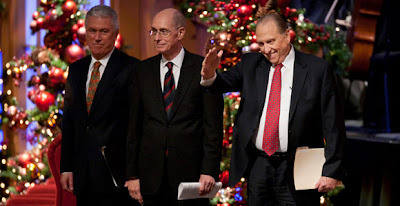 President Monson then said that it makes him sad to see the ever increasing commercialization of Christmas. It is becoming less and less about Christ, and more and more about shopping, marketing, and toys. We need to recapture and keep the spirit of Christmas by implementing Christ-centered traditions in our homes. He shared one such tradition in his own life: Every year, President Monson takes a few hours to read Luke 2, "The Christmas Carol" by Charles Dickens, and "The Mansion" by Henry Van Dyke. President Monson gave a summary of "The Christmas Carol" and "The Mansion". Since I assume that most of you are already familiar with "The Christmas Carol", I will focus instead on "The Mansion" (a book that I had never heard of before tonight). "The Mansion" tells the story of a wealthy, politically powerful man named John Weightman. John was a generous man--he had donated to the wing of a hospital, to schools, to churches, and to other notable charitable causes. BUT John only liked to give if he got the credit for it. John said, "Of course you have to be careful how you give, in order to secure the best results--no indiscriminate giving--no pennies in beggars' hats!" One Christmas Eve, as John was reading a verse from the Bible, he fell asleep. In his dreams, he was taken to heaven, as men and women were each shown their respective mansions. Finally, after waiting and watching so many others being given large and spacious mansions, John was taken to a small hut. "This is your mansion", he was told, because, "that is all the material you sent us". After he awakens, John's heart his changed, and he realizes that true service must be unselfish. President Monson said, "He had a life yet to live, love to share, and gifts to give." President Monson further explained that the spirit of Christmas illuminates us as we become more interested in "people than in things". Rather than "spend" Christmas, let us "keep it in our hearts", for when we keep the spirit of Christmas, we keep the Spirit of Christ. There is no better time for us than now to rededicate ourselves to the cause of Jesus Christ. As we strive to serve others and become more like Christ, we will have joy and happiness in our lives and peace each day of the year. As I have mentioned in a previous post, I know firsthand of President Monson's own example of Christlike service when he came to visit me at my sister Amy's wedding reception after I had had lung surgery. President Monson spends so much of his time serving, visiting, and caring about others. He truly is a man of God. I love him and want to be more like him. I hope you have a wonderful Christmas season! Definitely somebody to look up to. Vipin, you're welcome! Thanks for reading my blog. I missed the devotional last night. .. thanks for your blog! You did great!! !